The 1990s marked a time of seismic change in hockey: The Iron Curtain fell, providing a massive influx of talent from Eastern Europe, NHL franchises migrated from Canada and traditional markets in the Northeast and Midwestern United States to new ones and the League embarked on a rapid and ambitious expansion plan to the Sunbelt and beyond. That atmosphere proved ripe for exploitation by the right kind of visionary minds. Enter Bill Davidson and Rick Dudley, the former, a glass manufacturing mogul who presided over a pro sports empire, and the latter, a respected talent evaluator with progressive ideas about how to run a pro hockey enterprise. Together in 1994, they gave birth to the Detroit Vipers, an independent International Hockey League franchise that cut a rollicking, phoenix-like path through the decade. Playing out of the Palace at Auburn Hills, the home of the Davidson-owned Detroit Pistons of the NBA, the Vipers used the Pistons' charter plane for travel. While other minor-league franchises rode buses for hour upon hour, the Vipers whimsically flew to road games as close as Kalamazoo, 140 miles away -- or about a 15-minute flight. Their top-notch facilities included a hot tub and a sauna. Former player Stan Drulia recalled a game in Cincinnati the night of one of the famous Evander Holyfied-Mike Tyson boxing fights. The players asked the pilot to wait long enough after the Vipers' game before returning to Detroit so that they could visit a local establishment and watch the fight first. "Those are the privileges you appreciate and we were able to take advantage of," Drulia said. Players like Miroslav Satan, Petr Sykora, Sergei Samsonov, Peter Bondra and even Gordie Howe, at age 70 on a bit of a gimmicky promotion, suited up for the Vipers, who in their brief seven seasons won a Turner Cup title in 1997 and lost in the finals of another in 1998. Dudley said that for a while he had the best job outside of the NHL. "It was the best minor-league situation I've ever seen and will ever see -- simply because Bill Davidson was just an incredible guy," said Dudley, now Senior Vice President of Hockey Operations with the Montreal Canadiens. "…There was never a time I didn't enjoy myself." For Dudley, the job paved the way for him to become a general manager of the Ottawa Senators, Tampa Bay Lightning, where he was the architect of the 2004 Stanley Cup champions (though fired before that 2003-04 season), and the Atlanta Thrashers. In a time before mid-career fourth-line players began leaving the NHL for higher-paying European leagues in the early 2000s, the IHL lured them with attractive salaries, in some cases as much as $250,000. The Vipers were right there paying some of the highest salaries in the league. Dudley said he can't remember exactly what might he might have paid particular players but estimates that the Vipers ranked in the top 20 or 30 percent of IHL teams in terms of payroll. "They ran it like an NHL franchise with Rick Dudley and Steve Ludzik," Drulia, a member of the '97 and '98 Turner Cup champion and finalists teams, said of Ludzik, who coached the Vipers for three seasons and Lightning for two. "…We got treated so very, very well." The Vipers' inaugural season was marked by fortuitous timing. The NHL lockout of 1994-95 left a void at the pro level for hockey-mad Detroit and the Vipers eagerly stepped in. Their attendance averaged 14,263, according to HockeyDB.com (the website uses the official statistics published by the IHL as released by Howe Sportsdata, according to Ralph Slate, who created and runs the site). In that first season, Dudley held the dual positions of coach and general manager and defenseman Mark Hardy served as player/assistant coach. The Vipers went 48-27-0-6. Hardy, now an assistant with the Chicago Wolves of the AHL after 11 years in the NHL as an assistant coach with the Los Angeles Kings and Chicago Blackhawks, had played the last of his 915 NHL games with the Kings the previous season. He described his unusual role as "more as a liaison between players and the coaches so (the coaches) had a feel for the room." "Even though I was playing I did do the penalty kill back then," he said. "It was like I'd have to catch my breath between periods and show them video. It was a little tough but we got by…. Back then, you're not telling just telling them what to do. You have to make sure you're doing it right on the ice, too." The Vipers' star was a 25-year-old center out of Harvard named Peter Ciavaglia. Ciavaglia had spent two years in the Buffalo Sabres' system, playing five games over two seasons in the NHL while scoring 72 goals in two American Hockey League seasons. Dudley, who spent parts of three seasons from 1989 to 1991 as coach of the Sabres, made Ciavaglia the first player he signed. 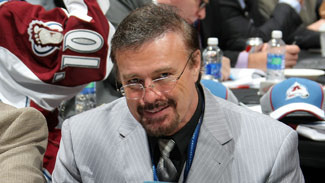 Ciavaglia said part of the allure of signing with the Vipers was the idea that IHL owners wanted to make their league a sort of stalking horse for the NHL – not necessarily a competitor but an alternative in some large markets (Atlanta, Los Angeles, Las Vegas, Detroit, Salt Lake, Orlando, Chicago, San Francisco) and to give them a leg up on the AHL in terms of competition. It was not necessarily a developmental league. 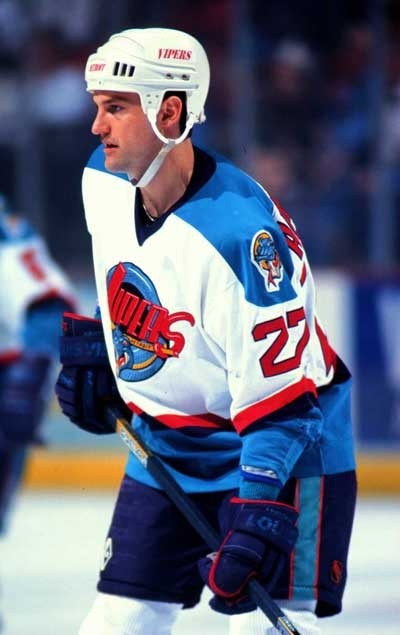 Ciavaglia had elected to spend 1993-94 in Europe to prepare for the 1994 Lillehammer Games (the last one before NHL players began competing) where he competed alongside current Nashville Predators coach Peter Laviolette and New York Islanders general manager Garth Snow. When he returned to North America, Ciavaglia elected to give the Vipers a try as he pursued his NHL dreams. He ended up a point-per-game player (357 in 355 games) with the Vipers over six of the franchise's seven seasons in existence before a chronic hip injury ended his career at age 30. "It was quite different than making $25 or $30 (thousand) in the AHL with the cities and where the league was going," Ciavaglia said. "It attracted a lot of players either on the cusp of the NHL or who had spent time there and were winding down their career and wanted to play a few extra years at a high level. It found a niche." One of the big box-office draws for the Vipers that first season was defenseman Jason Woolley, a former Michigan State and Canadian Olympic team standout. Woolley was a 25-year-old at the outset of his career when he played for the Vipers. He would go on to play 718 NHL games and was a member of Buffalo's 1999 Eastern Conference champion team. Dozens of players suited up for the Vipers that season but two little-known Eastern Europeans would become NHL stars, Petr Sykora and Miroslav Satan. The 19-year-old Satan played eight games for Detroit while Sykora, who did not turn 18 until about a month into the season, played in 29 games, scoring 12 goals and adding 17 assists. A few years later, the Vipers would use the same tactic in an even more high-profile and successful way with another 17-year-old Eastern European. The gambit would help to pave the way to the Vipers' only championship. The summer following the Vipers' first season, the New Jersey Devils drafted Sykora 18th overall. He won the Stanley Cup with the Devils in 2000. In all, Sykora had 323 goals and 398 assists in 1,017 games. Satan, who was drafted by the Edmonton Oilers in 1993, got his chance the following season and scored 18 goals in 62 games for Edmonton. Satan also went on to play more than 1,000 games in the NHL and posted similar totals to Sykora: 363 goals and 372 assists. Dudley said there were a variety of reasons for signing numerous Eastern European players at a time when they represented something of an unknown quantity. Some players wanted to prove to skeptical scouts and general managers that their high-end skills would translate to the more physical NHL game. The Vipers had practical reasons, beyond hockey ones, for wanting to sign them. "We did that for marketing," he said of Sykora and Satan. "It turned out that they also were pretty good players." That they were. So were the rest of the Vipers. Wayne Gretzky had formed a team of all-stars during the '94-'95 lockout that went on a barnstorming tour. The Vipers beat them 4-3 before 16,239 at The Palace. "I thought it was great," Mark Messier, a member of Gretzky's team told the New York Times after the game. "I was happy to see the Vipers come to play. Darn right I was insulted to lose. Better believe it. If not, you'd better stay home." Even without the NHL lockout, the Vipers' success at the box office continued. They averaged 13,305 in their second season, then 12,506, 12,847 and 11,566. One of the most successful promotions the Vipers undertook was "Gordie Howe Night" on Oct. 3 1997. The idea was that Howe would mark a sixth decade of playing pro hockey. According to media accounts of the game, The Palace was full to its capacity of 20,182 and Mr. Hockey received a standing ovation to start the game. "That was beautiful," Howe was quoted as saying after the game. "You always want to be in touch with the fans. The greeting was terrific." Howe played two shifts and was almost credited with a goal after a shot by Brad Shaw deflected off his shin and nearly went in the net. "It was the loudest cheer I've ever heard," Dudley said. "The loudest I've ever heard a building… If that puck had gone in, they'd still be cheering. It was an amazing, an amazing night -- one of many we had there. I got to meet people like (the actors who played) Elly May Clampett and Batman. There were more promotions going on. It was just great." Anyone who has encountered Dudley late in his career as a manager, scout or personnel director would be impressed by his tranquility, the almost professorial mien, with his glasses and goatee, and by how articulate he is. As a player, his competitive side was more pronounced. In the WHA, he had five consecutive seasons of more than 100 penalty minutes. Behind the bench, that fire also came out. "When you first come in, if you didn't know him, it took you a while to get used to him," said Jeff Daniels, who played for the Vipers in their first season and who now coaches the Charlotte Checkers of the AHL. "He's very intense, a very emotional guy but an extremely hard-working guy. He knew the league, knew players. He had his finger on everything. I've got a lot of respect for him, his intensity and his knowledge and the way he worked. There were no short cuts." Daniels described Dudley as highly emotional and vocal as a coach. He said a "switch turned" when Dudley was behind the bench. "You walk in and on you're on your toes right away," Daniel said. "He was trying to get the most of out of all his players." Hardy, who said he is close with Dudley, learned a lot from his former coach and manager. "He was really, really intense," Hardy said. "He's really calmed down since then. I can remember if we didn't play the way we wanted, there was some destruction in the locker room afterwards. He kept everyone on a short bench…. "Now he seems to bring a calming effect to everything. He's very soft-spoken when you talk to him. He was probably going to have a heart attack if he didn't change." Despite their regular season success in 1994-95, the Vipers lost in the first round of the playoffs. The next season, they reached the second round. In their third season, 1996-97, Dudley handed the reins over as coach to Ludzik. Dudley said working with Ludzik, one of his closest friends, was one of the greatest pleasures of his long career. Later, when he became the general manager of the Lightning, Dudley would hire Ludzik again as his coach. During the summer of 1996, Dudley and a player agent, Jay Grossman, hatched a plan that would help to bring the Vipers to the pinnacle of success. While Sykora and Satan had short stints with the Vipers and played small roles, Dudley and Grossman came to an agreement to bring another young Eastern European to the Vipers – one who would play a major role both on the ice and in galvanizing the Vipers' chemistry that season. Left wing Sergei Samsonov was only 17 at the time and turmoil with his Russian club, CSKA Moscow, caused him to cast an eye towards North America. CSKA, also known as the "Red Army" team, was poised to split in two and Samsonov feared that he would be relegated to a lower division. The hardest part of finding a team with which to play in North America, Samsonov said, was finding one that was independent. Grossman and Dudley worked out a deal – Dudley thinks it was for between $150,000 and $200,000 -- so that Samsonov could play for the Vipers. Samsonov and his father Viktor, both of whom spoke limited English, moved to the Detroit area. Samsonov's mother and younger brother visited occasionally. Now, it is fairly common for European players to spend a pre-draft year playing major junior or U.S. collegiate hockey. At the time, the Vipers were stepping into somewhat new territory. "I'm pretty sure I was drafted by a junior team," said Samsonov, who still lives in the Detroit area. "So it happened that they released me that summer because they didn't think there was any possibility for me to come over. The Vipers kind of fit the bill. I was thrilled." Samsonov, at 5-foot-8, was a dazzling skater and puck-handler. He scored 29 goals in 73 games that season, finishing second on the Vipers. Now a part-time scout for the Carolina Hurricanes, Samsonov realizes that his methods probably put a lot of gray hairs on Ludzik's head that season. "I had to be a hard one to handle," he said. "Not only did I not speak a whole lot of English but any definition of playing a system wasn't there for me yet. He had to put up with me. Looking back, he managed as good as he could have done. He let me be who I was and go out and play and figure out some things later. There's a lot of thanks goes to him. He let me do things that 99 percent of the coaches wouldn't let." Drulia, now an assistant coach with Milwaukee of the AHL, recalled Samsonov as "a real quality kid." "Even though language was there, he tried to fit in with the group," Drulia said. Samsonov said one of his great challenges was playing in a man's league – because the IHL wasn't primarily a developmental league, it tended have older, more physically mature players than the AHL. Samsonov said his teammates had his back both on and off the ice. Dudley said he thinks the players bonded over the young one in their midst, that they took care of him and, because of that, the players bonded better. "I'd say to this day (Ludzik) and I talked about it but we think that Sergei Samsnov won us a championship because he was simply such a good kid," Dudley said. "He was 17 years old and they wanted to take care of him and they brought him along. It was very, very important for those guys that he succeed and get drafted as high as possible. All these things played into as probably a unique way." Ciavaglia remains close with Samsonov and is his financial advisor. "What I remember most is that the year we won the championship we had little to no egos on the team," Ciavaglia said. "It was a special group. We had young guys like him. We had guys who played in the NHL many years, guys on the cusp of going to the NHL. We kind of adopted Sergei. He was highly touted and going to go in the first round. We felt like big brothers. We wanted to see him succeed. There was a cultural gap, age gap. He was somewhat in isolation with his dad." The Vipers went 57-17-0-8 during the regular season and stormed through the playoffs, losing only six games. They defeated the Long Beach Ice Dogs in six games in the finals to claim the Turner Cup. Jeff Reese, most recently the Philadelphia Flyers' goaltending coach, was the Vipers' goalie. At first, he struggled with being demoted to the minor leagues, a signal his 13-year NHL career was coming to a close. However, he made the best of it. Dudley and Ludzik later took him to the Lightning where he was an assistant on the Cup team. "I was very, very upset when I got sent down because I saw the end coming," Reese said, "and then when you win a championship, it turned out to be very, very exciting, even though it was the IHL level." Samsonov went on to get drafted eighth overall by the Boston Bruins that summer and won the Calder Trophy in 1998. 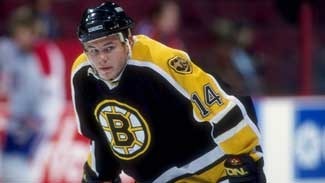 In his first five seasons with the Bruins in the NHL, he averaged 25 goals. He played 888 games in the NHL and was a member of the Oilers when they lost in seven games to the Hurricanes in the 2006 Stanley Cup Final. Despite a successful NHL career, Samsonov said that season with the Vipers ranks right up there. "Personally, it ended up being one of the greatest years of my hockey career," he said. "Ending up winning the whole thing, it was a thrill. Being my first year, I kind of, sort of took it for granted. Looking back it was a great experience." In 1997-98, the Vipers finished with 109 points (down from 122 the previous season). They advanced to Game 7 of the Turner Cup Finals but lost to the Chicago Wolves. Prior to Game 7, a brawl broke out on the ice among the players. Police had to get involved in the tunnel leading to the locker rooms to keep players separated. The Wolves were very similar to the Vipers. They flew to almost all of their road games. 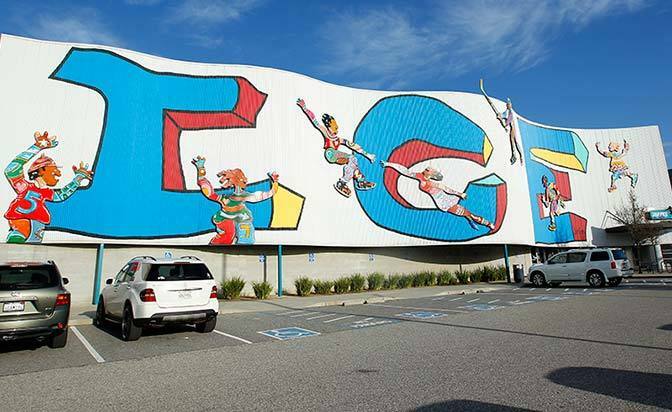 They had a large arena, played in a big, large traditional hockey market and their owner also put significant resources to bear in terms of payroll and facilities. Winnipeg Jets general manager Kevin Cheveldayoff was the Wolves' general manager back in 1998. "It was a very competitive league," Cheveldayoff said. "You competed on the ice as well as off. You competed for the free agents. The nature of those markets at the time was you could change a roster quite a bit over a short time. There was always that challenge to stay cutting-edge and stay ahead and Detroit always found a way to be an upper-echelon team when it came to a lot of those things." Shortly after that '98 series, Dudley left to become the Senators' general manager. The Vipers earned 111 points in the following regular season but were eliminated in the conference finals. That proved Ludzik's final season, as he became the coach of the Lightning – which Davidson had bought. By 1999-2000, the Vipers had become the minor-league affiliate of the Lightning. Whereas the team had been filled for years with players whose names became familiar to fans, it soon became filled with unrecognizable prospects. That hurt the Vipers both in the standings and at the box office. From 111 points, they fell to 52 in one season and attendance plummeted by almost 2000 per game to 9,838. Ciavaglia's final season was the Vipers' penultimate one. "We were young with no-names and lost all the time. We went from drawing very good crowds to very sparse crowds." In 2000-01, the Vipers earned the same measly points total but attendance was almost halved to 5,163, almost one-third of what it was in their inaugural season. Their coach was Shaw and it was his first head coaching opportunity. "We didn't have a great team," said Predators Director of Player Development Scott Nichol, whose only season with the Vipers was their final one. "We gave (Shaw) a lot of gray hair." On June 4, 2001, the Vipers met their end when the IHL, with too many franchises under the financial strains of high travel costs and competitive salaries, folded. Dudley said he thought the Vipers were attractive to Davidson as a second tenant at The Palace but were probably a money loser. Once Davidson had bought the Lightning, a minor-league franchise did not have the same value to him. Six IHL teams, including Chicago, joined the AHL. The Vipers did not. "It was an amazing and almost magical time for a bunch of us," Dudley said. "It's something you rarely see -- an operation that does everything right."